Synthetic phospho peptide (Human)containing Tyrosines 1054 and 1059. This sequence is conserved in mouse and rat. Porcine aortic endothelial cells transfected with a chimeric receptor consisting of the extracellular portion of the CSF 1 receptor fused with the transmembrane and intracellular domains of mouse VEGFR 2. 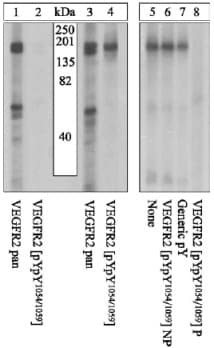 The antibody has been negatively preadsorbed using a non-phosphopeptide corresponding to the site of phosphorylation to remove antibody that is reactive with non-phosphorylated VEGFR 2. The final product is generated by affinity chromatography using a VEGFR 2 derived peptide that is phosphorylated at Tyrosines 1054 and 1059. Our Abpromise guarantee covers the use of ab5473 in the following tested applications. WB Use a concentration of 0.1 - 1 µg/ml. Detects a band of approximately 200 kDa. Blocking peptides at 5 % per lane. ab5473 staining VEGF Receptor 2 (phospho Y1054 + Y1059) in 90% confluent log phase Human umbilical vein endothelial cells (panel a) by ICC/IF (Immunocytochemistry/immunofluorescence). Cells were fixed with paraformaldehyde, permeabilized with 0.1% Triton X-100 and blocked with 1% BSA for 1 hour at room temperature. Samples were incubated with primary antibody (2 ug/ml in 0.1% BSA) for 3 hours at room temperature. 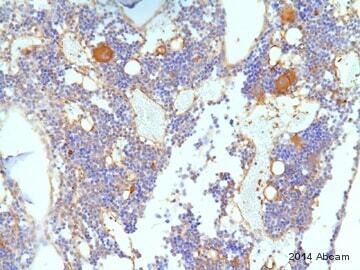 An Alexa Fluor® 488-conjugated Goat anti-rabbit IgG polyclonal was used as the secondary antibody (1/2000). Nuclei stained blue with DAPI (panel b), F-actin stained red with Alexa Fluor® 555 Rhodamine Phalloidin (panel c), merged image shown in panel d.
Publishing research using ab5473? Please let us know so that we can cite the reference in this datasheet. We have an abcam antibody product, and I am inquiring if it is possible to find out the expiration date of it? (expiration is not on vial). The product is: Ms mAb to Cystathionase, ab5473. Lot: 860547. Thank you! Thank you for contacting Abcam regarding expiration dates of our products. At Abcam, we guarantee the effectiveness of our products for a period of 6 months from date of delivery. Should you experience any issues using one of our products in the manner outlined on our datasheets during this time we offer scientific support, replacement or refund. I did search for the lot number that you provided and found that a product with this lot number was purchased on 22 January 2011 for UNM. While no longer under our Abpromise, this product should remain stable for up to 5 years if upon delivery it was aliquoted and stored at -20°C or -80°C, taking care to avoid repeated freeze / thaw cycles. I would like to encourage you to take advantage of our Abreview program. It takes just a few minutes to leave a review and you can collect Abpoints which you may redeem for Abcam products or Amazon gift cards while at the same time sharing information about the product with your colleagues worldwide. To leave and Abreview, go to the webpage for the product, click on the Abreview Tab right below the shipping information and clickSubmit an Abreview. You can gain more Abpoints by submitting images as well. Product ab5473 is produced against VEGF Receptor 2 / phospho Y1054 + Y1059. 1. Does the antibody require phosphorylation at both sites on KDR to bind, or just one (or the other)? 2. What was the amino acid sequence of the immunogen? Thank you for your enquiry. I can confirm that the immunogen sequence used to generate this polyclonal antibody was the dual phosphorylated form of VEGF receptor 2. (pYpY1054/1057). Because of the nature of polyclonal antibodies , it is potentially possible for batches of the antibody have some reactivity to the single phophorylated protein, but the greatest affinity will be for the dual phosphorylated epitope. I am unable to provide you with the immunogen sequence on this occasion as this information is considered commercially sensitive. I hope this information is helpful. Should you have any further questions, please do not hesitate to contact us again.